Blazers can be used in winters or otherwise, just for adding some more style in your daily look. 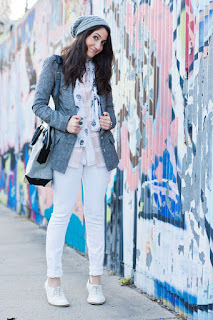 If someone wants to look classy and be effortless blazers are a good option then. 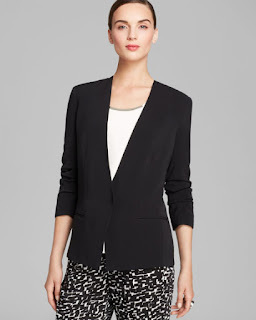 Even at work, hang outs, parties or casual routines, just pair up dress with a blazer and look fabulously dressed up. Unless you keep experimenting with the jackets, you can't find the different look. When everyone is stick to solid color jackets, use your statement style and go for check print jacket or floral. Pair it up with straight pants and a high heeled pump of some funky color. This look is equally good for office and outside boardroom.You may try any of these looks. Pink can never go wrong in whatever routine you wear it. Just pair a pink T neck blazer with a black n pink checkered skirt and here you are ready for the flamed up look. If you are getting ready for a work meeting and want to go for easy and clean look, just grab a white button down shirt along skinny pant with a light color blazer. You can make your look trendier by adding a strapped wrist watch matching with your pants color. Denims are love, best thing about them is whatever way you wear them, they are gonna compliment your personality. A dark color sleek look single button blazer, with a long chain and court shows with heels and make u look gorgeous. Sleek girls may going to love this love. Double breasted blazers are always in fashion and look trendy. Wear a mini skirt or jeans along any color double breasted blazer this winter and look Fab. These are bit dare to wear style and while choosing this kind of blazer one must be careful. A little bit of color pop may give u punk look but better go with a mid-length skirt or pant to compliment the military style jackets. When we talk of eastern styles, these jackets can also enhance the normal shalwar qameez. Wearing a short dress but want to add some class in to it? Just put on a bat wing blazer with your dress and here you are ready to show your class and taste in fashion. Get this look with going for unconventional dress suit and use some accessory instead of belt.